As a coach don’t you just love the beginning of a new year when people are naturally focused on setting and achieving their most important goals and dreams? This is the BEST time of year to enroll new coaching clients! To help you take advantage of the “New Year Effect” I created a valuable gift that will help you sign up new clients over the upcoming weeks and throughout your coaching career. In the Blueprint you’ll discover the proven Client Enrollment Formula that I teach in my paid training program, so don’t miss this special opportunity to access some of my best content at no charge! Discover the Client Enrollment Formula for Coaches – Free Here! 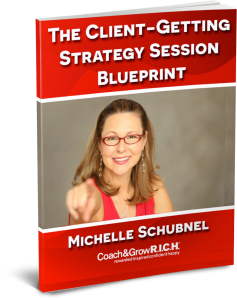 … The Client-Getting Strategy Session Blueprint will help a lot. But it’s only available for a limited time, so I encourage you to get your free copy now. Here’s to rocking it out in 2016! Be sure to watch the short training video that goes with the downloadable blueprint. I think you’ll find the sample scripts for the different parts of the Client Enrollment Formula is especially useful! Get the Blueprint and Watch the Video Here!